By searching on the net, I did find these pipes for sale, and to avoid to loose the chanse to get 2 pieces, a truck was rented right away. One roundtrip on Friday, and next trip on Saturday/Sunday, and the pipes did belong to me. 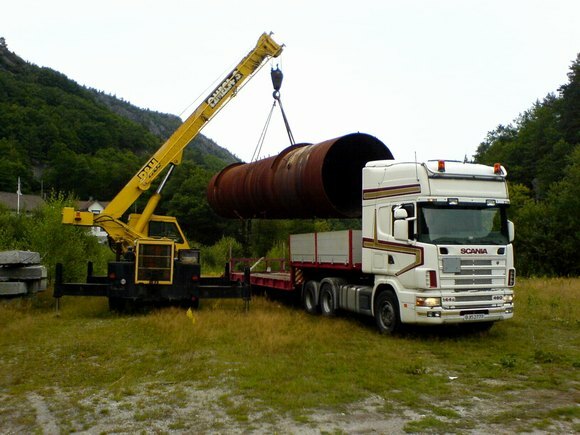 The second pipe, ready to be transported the 450 km back to Flekkefjord. 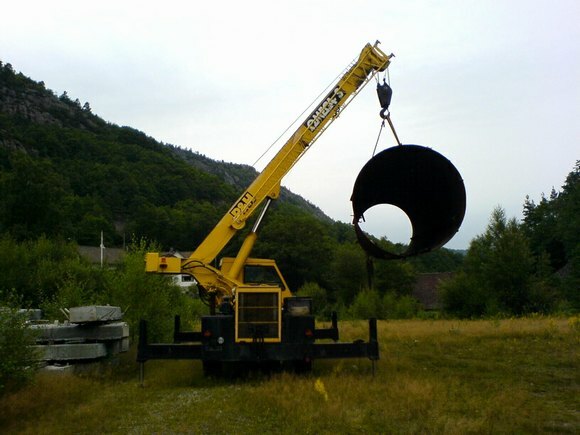 Lifting the 12ton pipe from the truck. Now the pipe is a load. Soon the pipe will be the carrier of the crane, jointed with the other pipe. Total weight of the barge will be aproxemately 45ton. 2 main engines will support travel and lifting, and a 6kw generator will be used as a spare/emergency unit. This is an example of what Skailand Kranservice will be able to deliver when the crane-barge is etablished.